We arrived in Xela (formally called Quetzaltenango) after a stomach-turning four-hour bus ride from Guate up into the western highlands of Guatemala. Although Xela is the second largest city in the country, the central part of town feels quite small. Most of the action, as far as tourists are concerned, is located within a few blocks of the Parque Centroamerica, a bustling plaza surrounded by the cathedral and several municipal buildings. Inside the square, locals gather to chat among an assortment of neoclassical monuments. Xela’s beautiful cathedral presides over its central square. 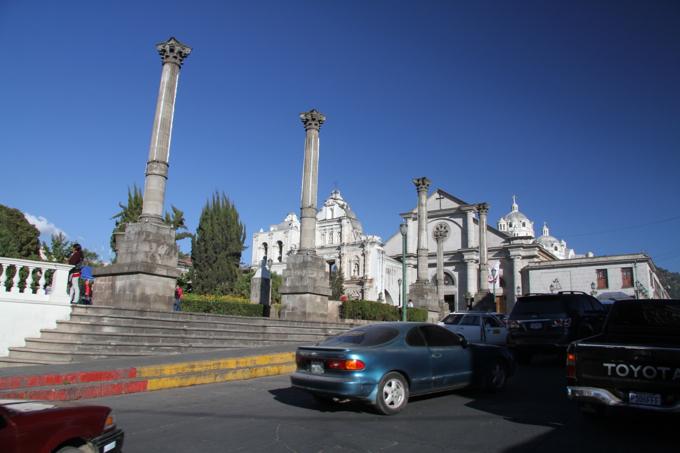 Neo-classical columns in Guatemala…Who knew? We found Xela to be reminiscent of the colonial Peruvian towns of Arequipa and Cuzco, only smaller in scale. 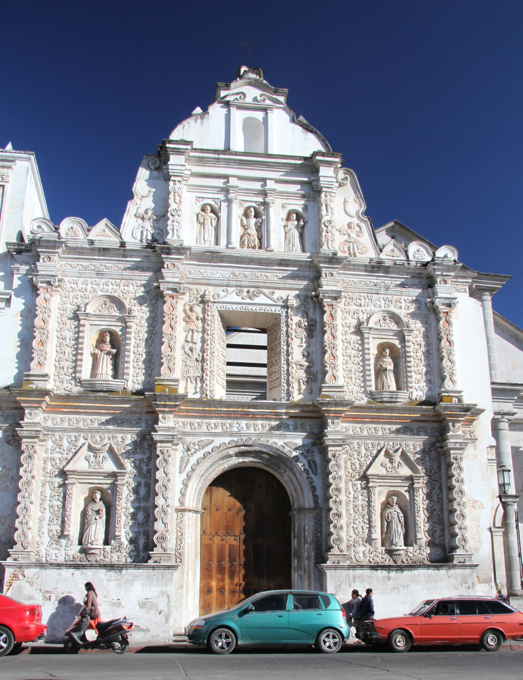 Xela attracts a lot of foreigners who come to study Spanish in the many schools located here. As such, it has a pleasant variety of international restaurants, which afforded us a break from the traditional fare of rice, beans and tortillas. There are lots of activities to do in and around Xela, including hiking up some of the nearby volcanoes, strolling traditional markets, or visiting a coffee farm. 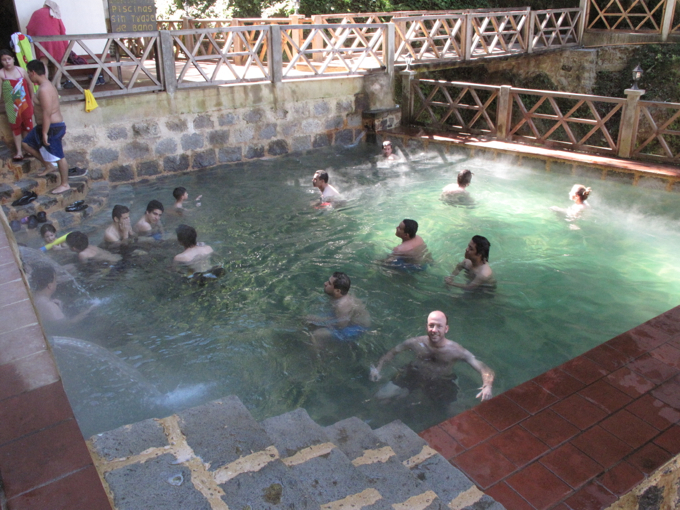 We chose to spend half a day visiting Fuentes Georginas, a series of natural hot springs located about 45 minutes outside of town. The drive through a charming agricultural region showcased the wide assortment of produce grown in this land of eternal spring. 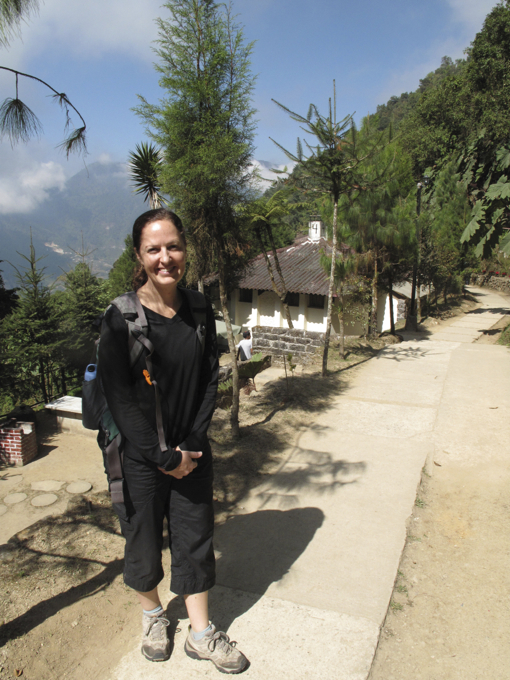 The Fuentes are a popular destination for foreigners and Guatemalans alike and for good reason. Perched on a mountainside high in a cloud forest, the pools themselves are surrounded by lush, tropical vegetation and framed by steep cliffs. There are several pools of varying temperatures to choose from, and we were surprised that the hottest was too much for these two experienced hot-potters to handle! Visiting the Fuentes Georginas was a great way to relax and warm the bones, as the highlands are noticeably cooler than the rest of Guatemala. 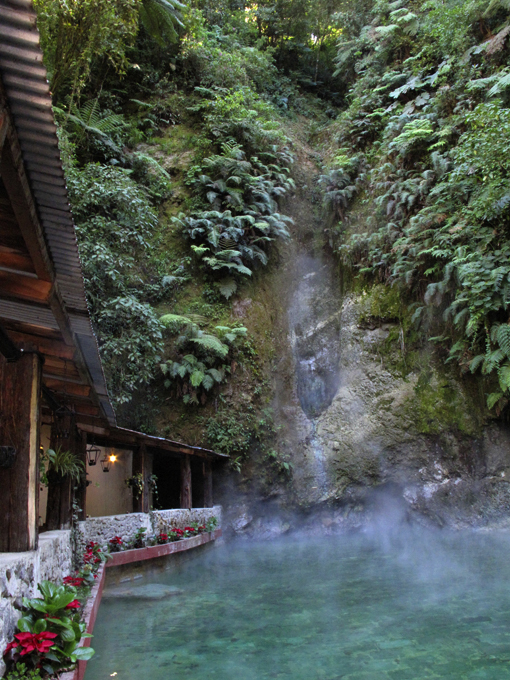 Turquoise waters, rising steam and lush scenery all added to the ambience of the Fuentes. Notice how this gorgeous pool is completely empty? Its waters were too hot for most! The temperature in this pool was more to everyone’s liking. Warm, relaxed and ready to hit the road! Travel Logistics: We traveled to Xela from Tikal. This involved catching an afternoon shuttle to Flores where we walked around the cute town and had a nice dinner before taking the overnight luxury bus on Línea Dorada to Guatemala City. Once again, the temperature on the overnight bus was freezing, but we were ready with our sleeping bags and our bufandas this time. Fool us once, shame on you; fool us twice… We arrived in Guate at 5:30 am and bought tickets for the 7:00 am bus to Xela. We were lucky to get some of the last few seats for this departure, so it would be wiser to purchase this ticket ahead of time. We booked our excursion to the Fuentes with Monte Verde Tours. For $15/person, this included a pick up at our hotel, the drive to the Fuentes, our entrance fee, 3 hours of soaking and a return trip back to Xela. It was money well-spent! Yes, the Fuentes are right up your alley. I am sure that you would have been in the super hot pool! Shon and I might make take a weekend trip to Xela sometime soon. The plan was to do a volcano hike–though I think a trip to Fuentes Georginas is now in order, too! I remember seeing a company in Xela that offered a 3-day hike starting from Atitlan and ending at the Fuentes, so you could actually hike there if you wanted to. No matter how you get there, it is definitely worth a trip. Let us know what you think if you make it.